It was written by Yinzhen 胤禎, the third emperor of the Qing dynasty and a devout Buddhist. In 1732 he had the Yonghegong 雍和宮 palace in which he had lived before becoming emperor turned into the Lama Temple, which survives as one of Peking’s favourite tourist attractions, and in his final years instigated the publication of a number of Buddhist works. He personally compiled this distillation of twenty Buddhist sutras and aptly named it One drop from the sea of scriptures. 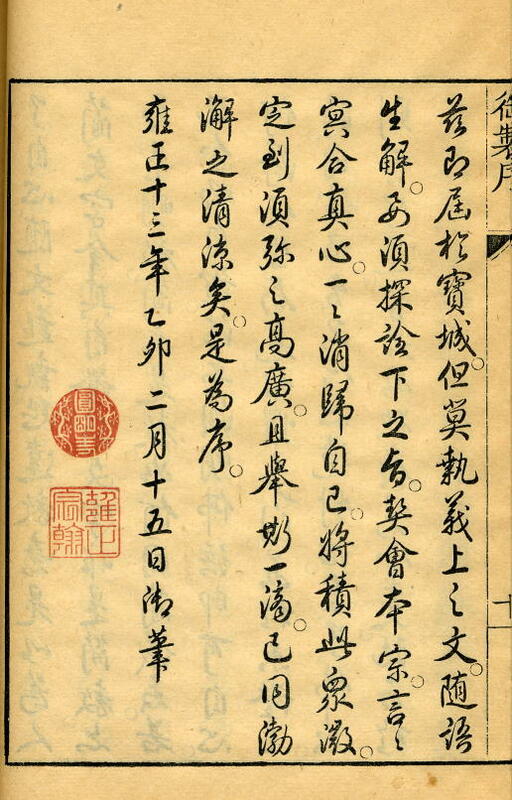 It was printed in 1735, and in the same year he gave the order to compile the Longzang 龍藏 tripitaka, which was finished three years later under the Qianlong 乾隆 emperor in 1738. 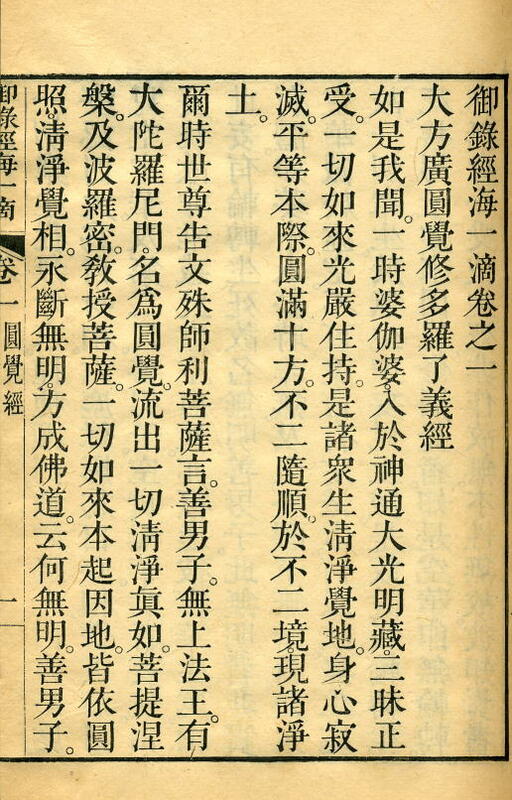 Unusually, as it contains no new material, One drop from the sea of scriptures was included in the Longzang, as the final work in the “works of this land” 此土著述 section (but here it is divided into 20 juan). The edition was printed in the palace, and is a perfect example of the genre. It is modest in size, and printed on bamboo paper. The impression is crystal clear, and must have been taken from the blocks very soon after they were cut. 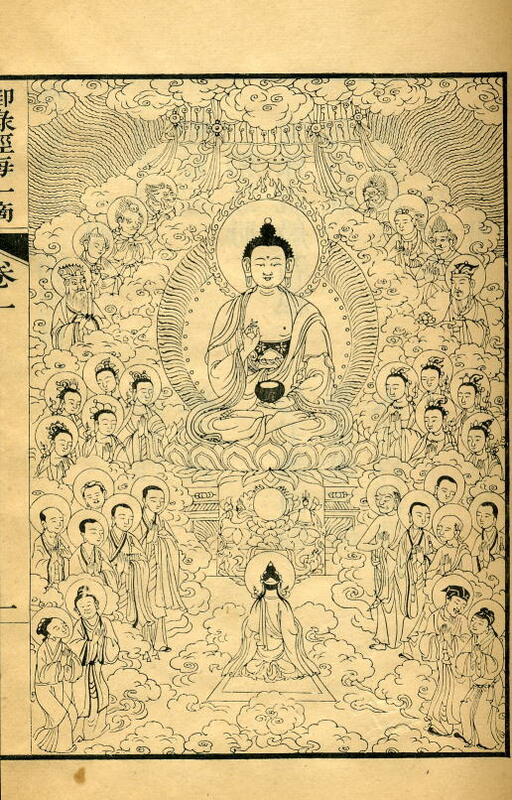 There are two illustrations: the Buddha preaching the Law as a frontispiece, with Weituo (韋陀 or 圍陀), the guardian of Buddhist scriptures and libraries, at the end (as in the Guanyin ritual). 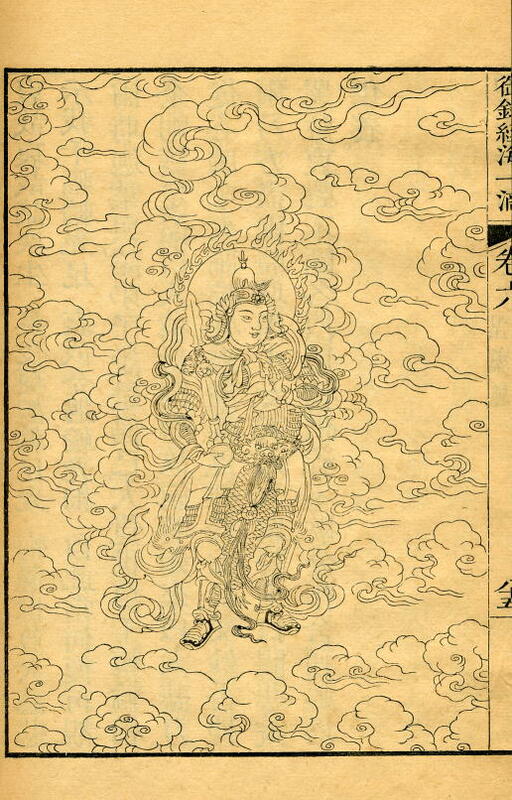 These two illustrations are among the finest examples of Chinese woodcut of the period.